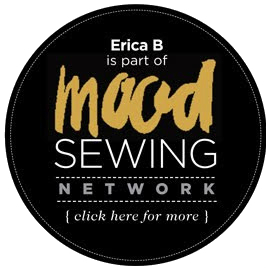 Erica Bunker | DIY Style! 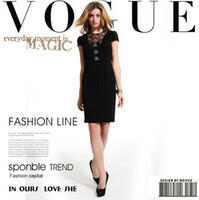 The Art of Cultivating a Stylish Wardrobe: Review: Vogue 1143 | Still color blocking and still loving it! Review: Vogue 1143 | Still color blocking and still loving it! In case you didn't know, color and I mean gorgeous happy colors will still be trending for Fall 2012. Check out the Pantone Fashion Color Report for Fall 2012. I'd been wanting to make more colorful pants for fall. But finding a pants pattern I really like is always a challenge. You can have a particular silhouette in mind, but finding a commercial pattern that fills the requirement is always difficult to me. This is what I wanted in a pair of trousers: A midrise; flat front with darts; darts in the back; fitted through the hip and thighs; flaring at the knee; a leg opening wide enough to cover my shoes while sweeping the ground. You'd be surprised at how difficult that is to find. Most commercial pants patterns with wide legs are usually wide from the hip down. Now what I've discovered about myself is that I look best in the least amount of fabric. And those pants with all of that fabric falling from the hip line just make me look bigger and wider than I am. It's the same reason I prefer sheath dresses to those with full skirts. I've had Vogue 1143 by Guy Laroche in my pattern collection since it was released. I don't know why I'd never noticed the cut of these pants before. I guess it's because the style of the jacket was stealing the limelight. If you've made pants before, these are pretty standard -- so I won't go into great detail. However, I cut the size 16, in a stretch twill and added 6 inches to the length. I wear heels and I wanted my pants long. I ended up with a 36" inseam, which is really hard to find in RTW in really nice pants. I used a 2" hem and followed Mimi's great tip on "Weighing Down Hems". 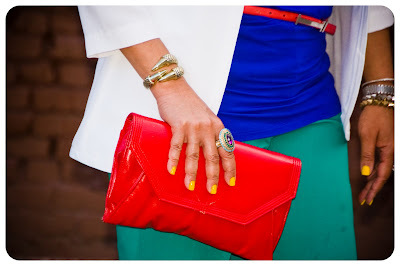 I added in more primary colors including my nails, to play with my Kelly green pants! 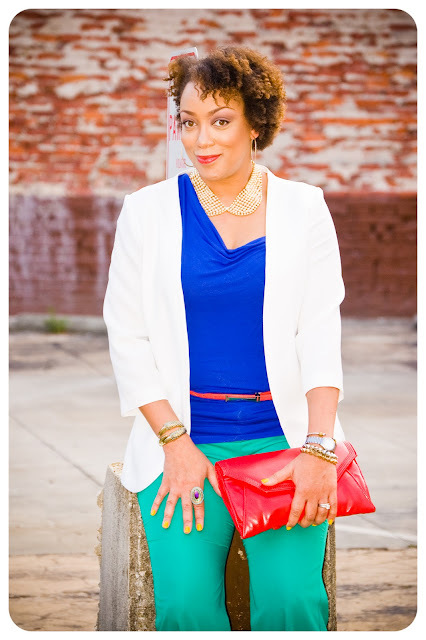 Wearing: blazer: Simplicity 2250; top & belt: TJ Maxx; clutch: Vintage; necklace: Forever 21. 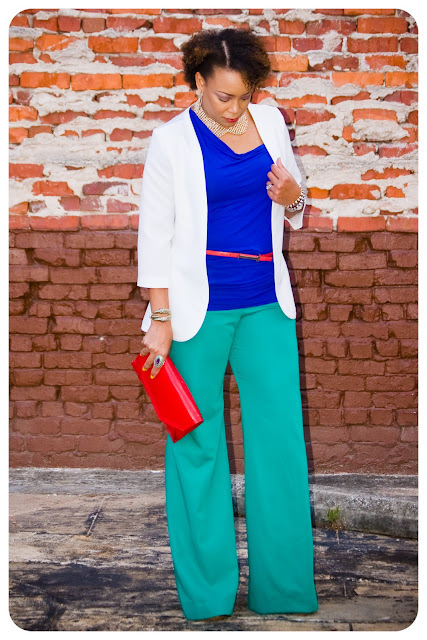 You have rocked the color blocking trend well this year. 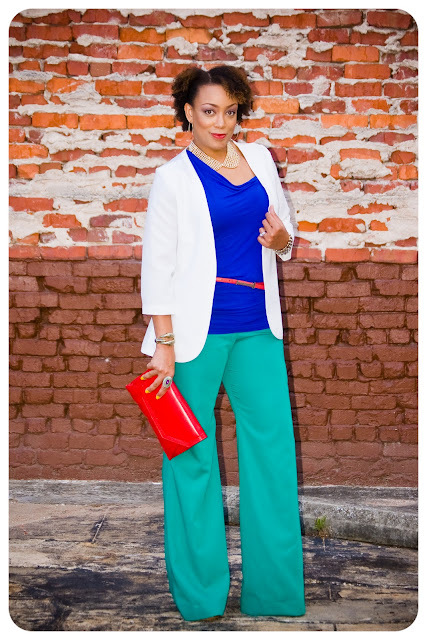 I wish I knew how to mix and match colors as well as you.I love the outfit, great work Erica! Gorgeous pants - I know what you mean about finding long enough RTW pants. I'm 5'10" and love heels! I was wondering if you have plans to make the Guy Laroche jacket. I always love seeing your creations and how you wear them! Cheers! Jacqueline, I don't as of now. 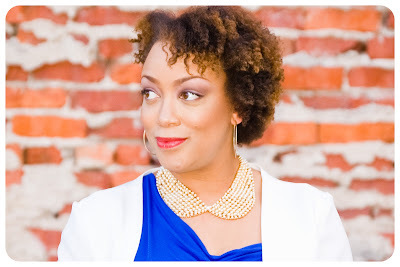 I plan to make a couple classicly tailored blazers this season instead. Thanks! I LOVE your pants! I saw a pair of these in an ad and was thinking how to alter my TNT pants pattern to get me a pair. These are perfect and I love the color. Will you make them in another shade? Carolyn, most definitely! I'm currently waiting on some stretch coral wool! Thanks! Those pants look awesome and so do you! What a great color. I must admit that the V1143 pattern's jacket is quite striking... and I would not have really looked at the pants had your post not been about them!!! You have been such an inspiration. I have been making clothes in bolder colours for myself, thanks to you. I hope I find someone willing to take photos so I can brag....did I say brag? I meant blog....about them. Keep them bold colours coming; you wear them well. I love the fit and color of the pants on you. I do have that pattern and now that I see the pants on you, I'm defintely making them for myself. Great pants, and fantastic look you put together. Thanks Nikki! I'm sure you'd have no problem with pants! As someone who's adding color into her wardrobe, I find your looks really inspirational (not to mention your sewing skills are incredible). You look great, and I love how you mix colors. Love this outfit and its colors! I like how you play with colors, shapes and textures ;) AMAZING! Gorgeous, I love you mix of color. I have my outfit set for tomorrow already and I will be wearing similar colors (green & blue) lol. I never noticed those pants before but you are prob right, I know its because I didn't get past the great jacket. You look fabulous as always! I love how you mix colors! The pants are lovely. Review : New Look 6130 | White & Coral. 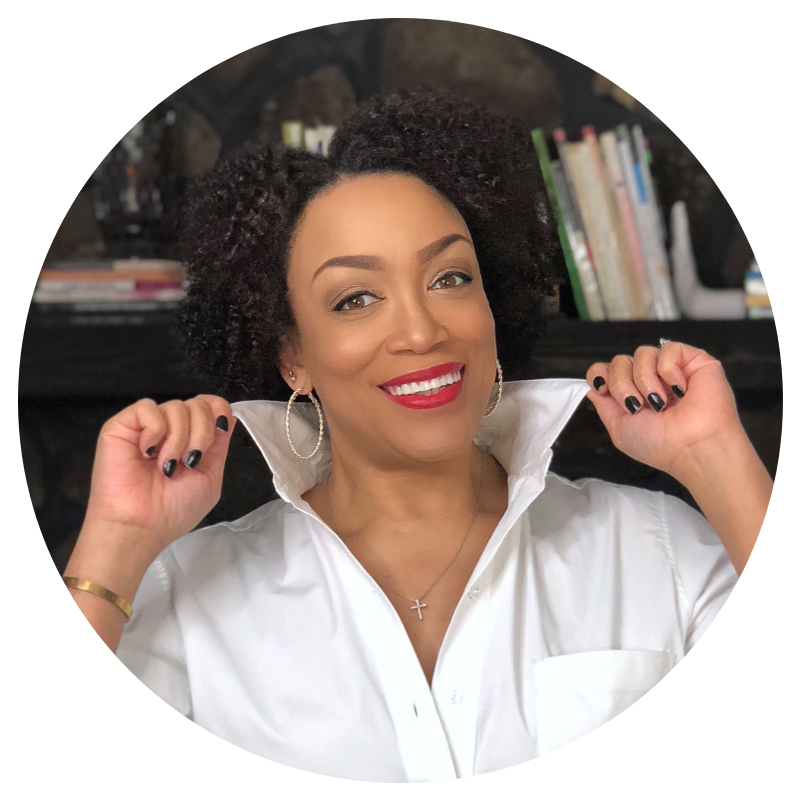 Review: OOP Vogue 2540 | One-shoulder Top! What I'm Wearing | A Citrus Sunset!